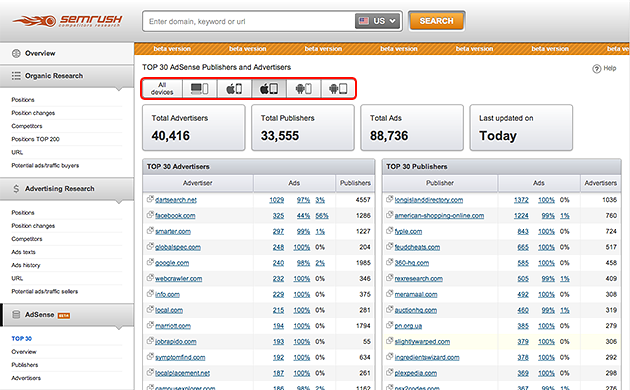 The SEMrush Adsense report. All devices are there! We have prepared a set of new options for SEMrush AdSense report, and the biggest one is Publishers and Advertisers distribution for different types of devices. You have the following devices to choose from: Desktop, Apple Smartphone, Apple Tablet, Android Smartphone, and Android Tablet. All-new handy tabs can be switched easily and direct you to the report for that device you'd like to explore including publishers, advertisers, and ads run. We love to get feedback from you, and now it has become even easier. 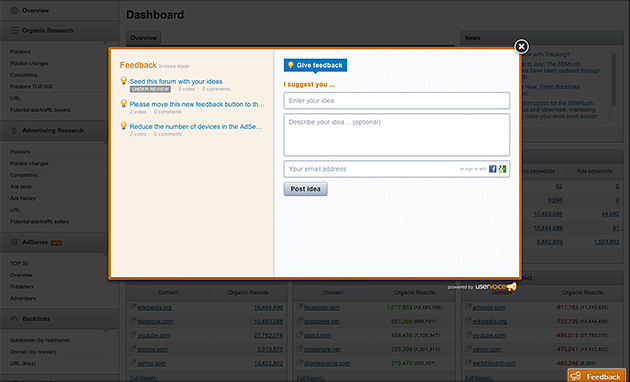 You can do it through any SEMrush page by simply clicking on the special feedback button in the lower righthand corner. AdSense now has a filter and export options!